Planting Dates: For spring, plant seed after all danger of frost. For fall crop, 12 to 14 weeks before the first average frost. In general, plant lima beans from April 1 to June 15 and July 1 to August 15. Seed Emergence: 5-14 days. Bush lima beans are the fastest to emerge and mature. Optimum germination is at 65°-85°. Height: 18 inches to 8 feet for the vining types. Final Spacing: 6 inches to 3 feet. 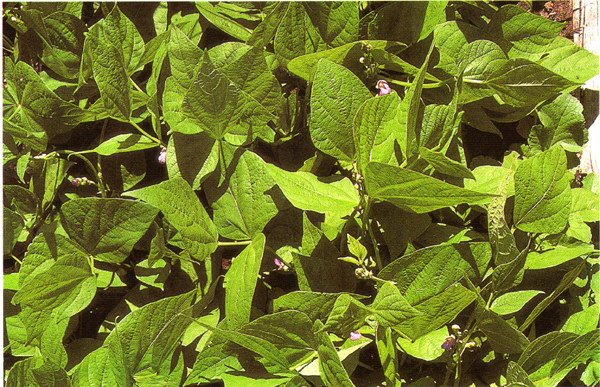 Green beans should be thinned to a spacing of 3-4 inches; limas 4-6 inches. Pole beans should be 8 inches or farther apart. The aggressive climbers should be planted as much as 36 inches apart. Eat the thinned sprouts. Growth Habits: Low bush to high-climbing types. Beans are warm season legumes that have deep growing roots. Culture: Legumes make a lot of their own nitrogen, therefore, don’t usually need heavy fertilization. Add an organic fertilizer at 15-20 pounds, at planting and again in early summer. Plant the seed in the spring when the soil has warmed in 16-20 inch wide beds. Limas need the warmest soil of all beans - at least 70°. Additional plantings can be made every 10-14 days for a longer harvest season. Plant beans in single rows and give the climbers something to grow on. Spray Garrett Juice weekly for top production. Troubles and Solutions: "Crusting" of the soil is never a problem when the plants are mulched well. Planting too early when the weather is still cool is a problem. Beans are fairly drought- tolerant, some more than others, but proper mulch helps them all. Avoid grass hay mulches because of the risk of broadleaf herbicides. Aphids, fleahoppers, cutworms, stink bugs, and spider mites are common troublesome insect pests. A regular spray with any product that contains seaweed helps greatly. A mix of molasses, compost tea, and citrus oil will control the tough ones. Add baking soda and garlic for diseases such as rust or powdery mildew. More Problems: There is evidence that all diseases including viruses, can be controlled by applying cornmeal at 20 pounds/1,000 square feet. Root knot nematodes can be controlled by tilling citrus pulp into the soil prior to planting. Harvest and Storage: Most bush beans mature in about 8 weeks, climbers take 10-14 days longer. Green beans should be picked when the pods are young and tender and the seeds are still immature and soft. Beans for shells shouldn’t be picked until full size and starting to change color. Avoid picking the beans when the foliage is wet. Varieties: Best bush bean choice for my money is "pinto." Other good choices include Contender, Roma, Tendercrop, Topcrop. Pole bean choices are - Blue Lake, Kentucky Blue, and Kentucky Wonder. Notes: Sulfur is a common organic pesticide used on beans. Remember that it will burn the foliage of cucurbits like squash and cucumbers. There is some indication that garlic can be phytotoxic to all legumes. Broad beans, fava beans, horse beans. These are all names for basically the same large beans (actually vetches) that like cool weather and are best grown as a fall crop. These beans require the same conditions and culture as bush beans. They can be picked and used as green, shelled, or dry beans. Asparagus or yard long beans. These produce beans up to 2 feet in length. These are climbing southern pea type plants that need to be trellised. Oriental intensive gardeners love these beans. Mung beans. Can be planted in succession. They like the hot weather like black-eyed peas. Multi crops. Soybeans. Warm season bush beans that should be treated like limas but need a longer growing season of about 120 days. They can be used as green beans, shelled or dry. Very nutritious beans.